On November 4, Israel bid farewell to a king. His name was Shaul Evron and he was the undisputed king of the Israeli culinary scene. He was also a man very dear to my heart. I was a newcomer in the foodie world in 1998 when I interviewed him for the Jerusalem Post. Actually, the whole concept of foodie hardly existed then, and when it did start to emerge, it was because of Shaul’s influence. He was a man without children, yet many of the countries top chefs thought of him as “Aba”. The eulogies at his funeral, the comments in the news and the looks on people’s faces all point to the great loss that is felt. If you are lucky, you will have a few mentors or muses in your life. People who have touched you, made you feel good about yourself, people who have left an indelible impression. Shaul did that for many, including me. He would have been embarrassed to hear all the things being said about him. As was joked at his funeral, he would have told everyone to stop it and get on with their lives. He might have said, “Oh, just go eat a good steak somewhere and forget all this nonsense.” Or more likely he would have poured you a glass of wine and asked your opinion about something. Shaul grew up in Tel Aviv with a Russian mother who excelled in French and Belgian cooking (“In the 1950’s, she used her ration stamps to buy butter, to cook the meat in!”). He traveled extensively and ate his way through myriad cuisines. A career in journalism led to writing about food, which led to co-authoring several cookbooks. He wrote about meat and kosher Italian food, he introduced food photos in the newspapers, he served up the topic of cuisine to the Israeli public and it has been expanding ever since. 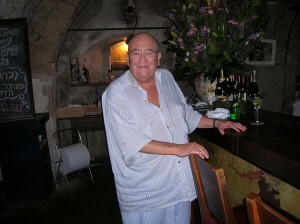 At last he found his place at Yoezer Wine Bar, which he opened in Yaffo, 1995, with his childhood friend Tzippie Asaf. It was at Yoezer where everyone gathered the night his death was announced. The chair at the end of the bar was Shaul’s and his presence will always be felt there. I had my first glass of Beaujolais with Shaul, and I did not care for it. He understood. I also had the most delicious glass of Chablis with him and I loved it. He smiled at my reaction and sent me home with a bottle. He fed me plate after plate of food during our interview and I could see his enjoyment as I sampled salmon tartar in a soy, wasabi and saki sauce; gravlax with a sweet dill sauce; country pate slathered on chunks of warm bread, foie gras; Salad Nicoise with fresh tuna and anchovies; slow-cooked lamb stew; cold sliced lamb with a pepper crust; corned beef as they make it in New York. He would not let me skip dessert so there was Belgian chocolate cake, cream caramel and a fresh fig tart with cream. I’m not a demur eater – and he loved that. He was not a man of many words, he could easily sit silently. Perhaps that is why when he spoke, you drank up every word. It looked as if he did not take care of himself – he was a large, barrel-chested man who smoke and drank and coughed a lot. In recent years he forfeited the smoking but the drinking? Never! I always wanted to caution him, to ask him to please take care of himself but I couldn’t , no one could. We once made a date to tool around Jaffa, so that he could introduce me to the little hole-in-the-wall places on Jerusalem Street known for their Bulgarian food. I picked him up at Yoezer in my car, and he refused to put on the seat belt. You think I could argue with him? He lit up as soon as he got out of the car and the cigarette came out of his mouth only when re-entering the car. He kindly asked me what I would like to eat, and spoke to me about how the different courses were made. I felt like the luckiest woman in the world – Shaul Evron was taking ME out to lunch! Shaul Evron was talking to me about Bulgarian food! Shaul Evron was spending time with me, a nice Jewish girl from New York whose Hebrew was pretty broken and whose knowledge of food left much to be desired. I’ve taken the opportunity here to memorialize this extraordinary man. I hope, that when you come to Israel, you’ll visit Yoezer and drink a toast to Shaul’s memory. L’chayim!